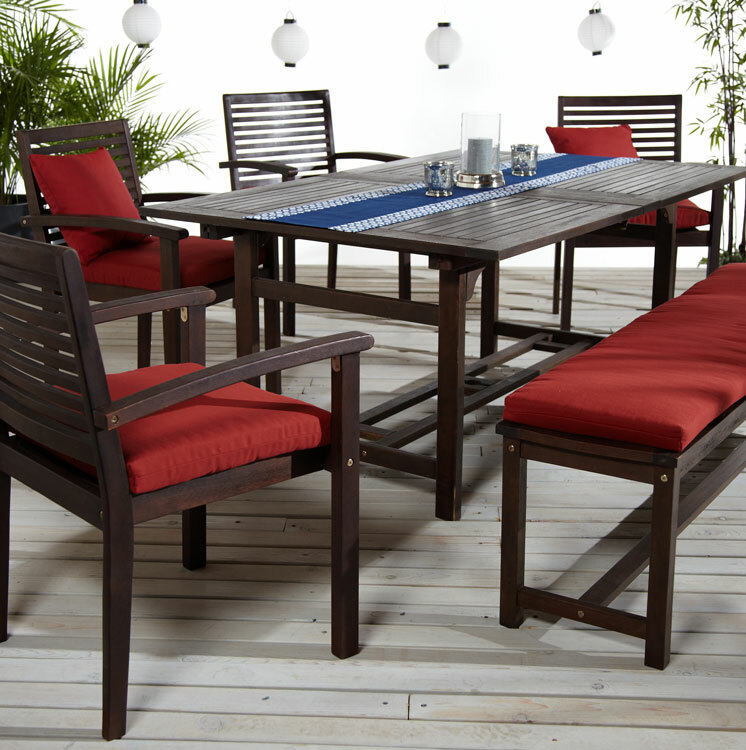 Strathwood has artfully paired contemporary elegance with modern ingenuity to create the Blakely dining collection. Carrying the Forest Stewardship Council (FSC) certification, this set is crafted of high-density Brazilian eucalyptus wood that is harvested in a sustainable fashion. The eucalyptus timber is highly sought after for the creation of outdoor furniture due to its strength and natural ability to withstand moisture and heavy use. Extend an invitation to friends and family to dine around the flagship piece of the Strathwood Blakely dining collection. This rectangular dining table includes built-in butterfly extensions that lengthen the table by 23 inches. When not in use, these easily fold up and stow inconspicuously underneath, eliminating the inconvenient need for separate storage. 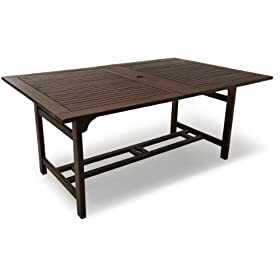 The table measures 67 inches long by 43-1/4 inches wide by 29-1/4 inches high when the extensions are not in use, and lengthens to 90-1/2 inches long, comfortably seating six or eight adults, respectively. Additionally, the mortise-and-tenon construction and center supports add to the durability of this fine table. As with the entire Strathwood Blakely collection, the dining table is stained a gorgeous chocolate brown. The fully-coordinating collection includes the extending dining table, the dining arm chairs, and the dining bench. To complete the look, further accessorize the bench and chairs with a selection of custom-fit cushions. These cushions are available in multiple colors and are designed exclusively for the Blakely collection. Filled with everLUXE poly-fill and covered in 100-percent, UV-treated polyester fabric, these cushions were created to weather season after season. Left untreated, eucalyptus will weather when exposed to the elements, and the stain will fade with time. In addition, when untreated, natural splitting or cracks will appear, but this will not affect the durability of the furniture. To guard against this weathering process and to maintain a desired look, apply coats of a hardwood oil. The frequency of necessary oil applications depends on the intensity of the outdoor elements. The furniture has already been oiled prior to packing, and it is recommended that an oil treatment be repeated at least once a year. Giving the furniture an extra treatment before exposing to rain will prolong the “new” look and ensure a longer life.